Calcium presence in water supplies results from passage over deposits of limestone, dolomite, gypsum and gypsiferous shale. Its concentration may extend from 0 to several hundred milligrams per liter,depending on its source and treatment. Calcium is necessary in plant and animal nutrition since it is an essential constituent of bones, shells and plant structures. Calcium in water as carbonate is one of the primary components of water hardness which can cause pipe or tube scaling. Hanna Marine Calcium Checker HI758. 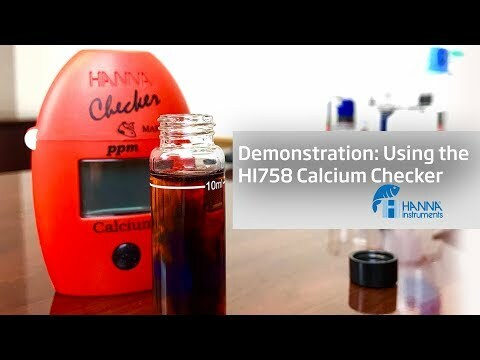 The HI 758 Calcium Checker®HC is extremely simple to use. First, zero the instrument by adding Reagent A and deionized water. Insert into the HI 758 and press the button. Next, remove the vial and add Reagent B and shake to dissolve. Reinsert into the Checker®HC and press the button to read the calcium concentration in ppm on the display. Weighing a mere 64 g (2.25 oz. ), the Checker®HC easily fits into the palm of your hand or pocket!. Hello, does it come with everything needed to check the water or is it only the unit for $44? This kit includes everything you will need to test your water. This device is a huge disappointment. It gives me the same reading every time, which is unrealistically high. I monitor my parameters closely. I've used this checker multiple times. The results are always the same, and always wrong.